Labour market performance within the United States offered a short-lived boost to the US Dollar. However, the rest of the US trading session eroded the underwhelming gains made on the back of convoluted, contradictory employment data. The erosion of the value of the US dollar, for example within the Eurodollar cross, can be partially attributed to Euro re-balancing. 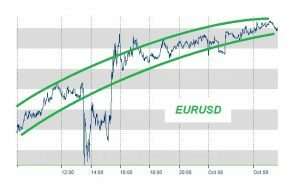 However, the perceptibility of a Dollar reversal across all Dollar-related currency pairs suggests an endogenous Dollar retraction. The headline figure of a decrease in the rate of unemployment, by 0.2%, offset weak payrolls data that saw 33,000 jobs lost in September non-farm payrolls data. The effect upon the US Dollar was temporarily positive in response to the unemployment rate. The effect was subdued, however, given the anticipated inaccuracy of hard data to economic performance following a smattering of natural disasters within US territory. The performance of the US dollar against its most globally significant counterpart, the Euro, is particularly intriguing. Displayed below, the currency cross can be shown to continue its intraday trend with almost complete disregard to the US employment data. Having previously analysed the payroll and unemployment figures against the US Dollar, this article instead seeks to examine the erosion of value that has purported to make hard data redundant. Last week’s trend of Dollar strength, is presented as a cyclical re-balancing following an unjustifiable spout of Dollar weakness amidst Euro strength. Kick started and maintained by the promise of a before-year-end interest rate hike, the re-balancing of the Euro is derived from expectations of Federal Reserve action, despite a weak rate of inflation. Moreover, whilst geopolitical risk surrounding the Dollar remains high, it is also becoming slightly dated. As investors believe they have fully priced in the enduring risk derived from the heightened tension within the Korean Peninsula, the Dollar is less constrained and can move freely. Political risk and uncertainty within major reserve currencies outside of the US Dollar appear to be mounting. This changes the cost-benefit decision of holding US Dollars – one of a finite and scarce list of international reserve currencies. For example, the Euro is currently being plagued by the Catalonian conundrum. As Puigdemont faces off against Spanish Prime Minister, Mariano Rajoy, the political risk within Spain and potentially the Eurozone, forces investors to factor uncertainty within their allocation decisions, attracting their capital to other currencies. Similarly, with the fifth round of Brexit negotiations scheduled to start this week, the perseverance risk posed by Brexit is reluctant to abate. Perhaps the retrenchment of US Dollar gains following a positive data release is due to market concerns about a forever-stagnant inflation rate. This would imply that following the immediate currency market euphoria that appreciated the US Dollar on the back of strong unemployment data, investors internalised stagnant inflation, in conjunction with accommodative monetary policy and low inflation, to signal the evolution of a new economic paradigm; one where interest may never rise. This perhaps forebodes the later speech of permanent member of the Federal Open Market Committee, the body responsible for setting US interest rates, William Dudley. In his New York address, the President and CEO of the New York Federal Reserve Bank, highlighted that hyper low inflation is likely to be, in part, attributable to “more fundamental structural changes”. Therefore, perhaps the unexplained reversal of gains within the US dollar are down to investors’ repricing the probability of multiple 2018 interest rate hikes. The Dollar has consolidated strong gains this week, trading at more comfortable levels against the Euro and the Pound, and escaping the highs in excess of 1.20 EURUSD and 1.35 GBPUSD. The sustainability of these progressions is likely to be challenged on short term, idiosyncratic bases. Therefore, the medium and long-term trend for the US Dollar appears likely to be biased in favour of a steady and considerable appreciation.